Another one with no scones. We’ve not been out much recently, partly because Julia has been making me give books away (or “declutter” as she likes to call it) and partly because we are trying to economise. Despite my lottery win we are still adjusting to Julia only having one job. On Friday, we decided to treat ourselves to a McDonald’s breakfast. It’s not something to boast about, but as they serve 3.5 million customers a day in the UK it’s not like I’m alone in my poor diet choice. The problem, of course, was that I’d already had one on Monday. One a month is acceptable, one a week is borderline. Two a week is a source of shame. Anyway, as we haven’t had scones recently, I decided that this would have to do. It’s difficult, when looking at a Sausage and Egg McMuffin, to work out where the sausage element is. These are sausages. Proper British breakfast sausages. It’s also difficult, having read that it was inspired by Eggs Benedict, to actually see the similarity, apart from the egg and muffin. That’s a bit like calling a bicycle a horse and cart just because it has wheels and a saddle. Despite this, the sausage and egg McMuffin, particularly with the addition of BBQ Sauce and black pepper is a good start to the day. The best bit is probably the chance to sit and talk for a while. Too many of our mornings are spent rushing about, and it worries me that Julia doesn’t see enough of me. That’s why I took the final photograph – I thought you’d like to see a picture of a woman spending quality time with her loved one. Note that I got us the best table, just by the toilet door. Help, get me out of here! This entry was posted in Uncategorized and tagged breakfast, eggs Benedict, Julia, McDonald's, quality time, sausages on April 13, 2019 by quercuscommunity. The day started with me waking early and leaping from my bed, full of joy and ready for action. I’m not sure why, and I should have suspected it was too good to be true. 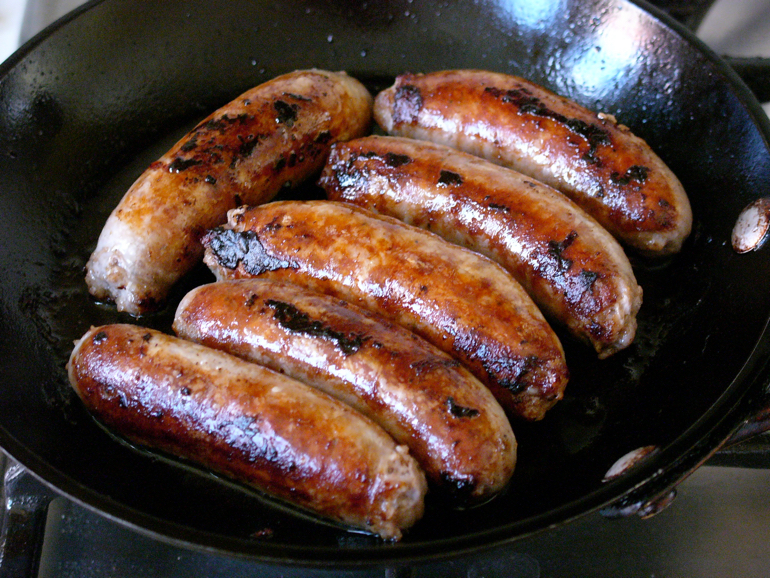 Breakfast was good – cold sausage sandwiches with brown sauce. Not to everyone’s taste, I know, but I like them. The journey to work was fair and I managed to park outside the shop, though some idiot had parked so badly they had managed to use two spaces. I’ll skate over the next few hours. The shop was hot and airless, we’re having a few problems on eBay and I have a co-worker with the acquisitive habits of a pack rat. If I put anything down on the desk – pen, tape, ruler, stamps or scissors – it mysteriously disappears and reappears in his work space. It’s an annoyingly inefficient way of working. This all paled into insignificance after the horror that was “doing the laundry”. I managed to get out of doing it yesterday but Julia cornered me tonight and we ended up in the launderette. It was hot. Someone had three driers going. And the woman who looks after it came in halfway through kept moving us so she could clean. This was bad enough, but when we started to unload the machine at the end we found we’d ruined two of my pens by putting them through the hot wash. I was devastated. They cost me 99p each. However, I’m a happy-go-lucky sort of bloke and am trying not to let it upset me too much. Julia, on the other hand, is taking it quite badly. It seems that black spots on white work blouses and brown linen tops are Bad Things. Very Bad Things. I’ve used a picture of Tim Hunkin’s dog from Southwold Pier – if he had a house we’d be sharing it tonight. This entry was posted in Uncategorized and tagged bad luck, brown sauce, dog house, early rising, good luck, ink stains, laundry, office, sausages on July 16, 2018 by quercuscommunity. After a night of strong wind the low temperature and the cold weather are back. It’s hard to remember such a depressing Spring. In fact I’m not sure there has ever been such a depressing Spring. This week I’m going to try for daily posting again. I’m going to make a start by posting this simple complaint about the weather. The year is now one third of the way through and we’ve had about a week of decent weather. I’ve made very little progress on decluttering and the well-regarded decluttering book I bought has been absorbed into a pile of books and can no longer be seen. It lacked pace and plot and was generally a bit dull, to be honest, which is why I’d rather read detective fiction and let the house fill with clutter. I may start decluttering again if I can find a book about a woman who kills her husband because of his untidy habits. Or vice versa. Breakfast was two sausages that I cooked last night and put to one side. The paprika was an unexpected extra. I was too lazy to fry eggs and mushrooms. After breakfast, washing up and answering overnight comments on the blog it is now time to set off for the shop. We have 15 items to pack and send off, including three which were only put up for sale on Saturday. The Budgerigar society badge sold for £6.50. This gives me an excuse to use the photograph again. This entry was posted in Uncategorized and tagged bad weather, blog comments, breakfast, daily post, disappointing Spring, Ebay, sausages on April 30, 2018 by quercuscommunity. I’ll carry on the burger post later. I thought I’d better do something that involves a photograph for the moment. The photograph is Sausages with Roasted Ratatouille. It’s not quite the same as the recipe photograph that I had. My vegetables never seem to cook as attractively as the ones in recipe pictures. It also didn’t help that I forgot to buy peppers and couldn’t get the right sausages. And they said red onions but I could only get the small size in brown. That probably made a difference too. Despite this it didn’t turn out too badly in the end, and with a bit of rearrangement three floppy mini peppers from the back of the salad drawer put up quite a decent show. I was quite pleased with the way it worked out and it had a good flavour thanks to three cloves of wrinkly garlic (you could probably use ordinary garlic but I always leave mine hanging round for a few weeks to mature) and a couple of sprigs of rosemary from the garden. As long as I can use my own rosemary I can pretend I’m a proper cook. This entry was posted in Cookery and tagged embarrassment, food photography, garlic, healthy, portion size, ratatouille, roast vegetables, rosemary, sausages on April 26, 2018 by quercuscommunity. How does weather affect your mood? The title is another from the random subject generator. It’s not quite random because I refused the first one – “Describe an Ornament”. We have a house full of clutter and I don’t want to remind myself of it by describing one particular piece. So, how does the weather affect my mood? Obviously I feel good when the weather is good and less good when the weather is bad. That was an easy one. I’m rapidly losing faith in the random subject generator. Here is a selection of messages written on tiles in the Mencap garden. I’ll be able to return to posts with more pictures tomorrow because I’ve bought a new card reader from ASDA. I nearly had breakfast while I was there, despite the memory of it being fairly rank last time I had it. The service was so slow my knee gave way while I was standing in the slow-moving, and slightly mutinous, queue so I left. This was, I’m pretty sure, a blessing in disguise. I finally had breakfast in the square at Newark – two Lincolnshire sausages in a bun with fried onions and brown sauce. It was very tasty, and much better than ASDA. The resulting mess demonstrated my wisdom in selecting shirts in food-coloured check patterns. After scraping up the spilt onions you could hardly see the mark. This entry was posted in Uncategorized and tagged Asda, Mencap Garden, Newark, onions, random subject generator, sausages, weather on September 21, 2017 by quercuscommunity. The day started with a visit to the farm – we are still tidying up as we had an enforced rest over Christmas due to my infection – and continued with a visit to Men in Sheds. They made us tea and offered to share their Lincolnshire sausages. We declined the offer, but donated half a dozen pullet eggs from the bantams, who seem to have sprung into laying action while we’ve been away. On the way home we dropped in to feed the ducks at Rufford Abbey, which was the fun part of the day, and pottered home as the light faded. That was where we got our big surprise. Julia opened her emails and was rendered speechless. It’s quite strange seeing Julia speechless. she impersonates a goldfish and emits tiny mewing sounds. I waited patiently, and after she recovered the power of speech she read the email to me. When I recovered the power of speech she told me off for using bad language. It seems that one of the teachers who has been visiting the farm has arranged to rent land on the farm to start a group using horticulture and animals for therapy. Sounds vaguely familiar. Also seems like it must have been organised during the time we were being thrown out. What really stopped us speaking though, were the words “As I understand it, the timing was right for change for all of us”. The timing, as you may recall from previous posts, was not right for us, but was forced on us. However, it seems to be a growing belief within the farmer that he did us a favour as we were working hard and not making a living from the project. That, of course, makes him feel better at throwing the group out. It also highlights the difference in our approaches, as we don’t need a lot of money if we’re doing something worthwhile. Anyway, now I have recovered the power of speech I’m not going to waste it. The lake at Rufford was still partly frozen, providing hard standing for a variety of birds. We had bird food with us and, as you can see from the video it inspired some enthusiastic feeding. The light was fading, so we restricted ourselves to the lakeside. I did try a couple of photos of squirrels under the trees but the light was so bad that camera shake rendered them useless. I’m currently trying to improve my bird identification skills so I had a good look at the gulls and was pleased to find two that were different from the mass of Black Headed Gulls. They were both immature birds so they have lots of brown feathers and their beaks and feet are different colours from the mature adults. I took plenty of photographs and checked them against pictures on a gull ID website. Yes, there are such things. One of the gulls seems to be an immature Common Gull. As you may gather from the name, it isn’t a rare gull. The other is an immature Herring Gull. They are even commoner than Common Gulls. It would have been nice to have spotted a rare gull but at least I managed to see them amongst all the others. This entry was posted in Bird Watching, Care Farm, Uncategorized and tagged bird feeding, gulls, ice, Lincolnshire sausages, men in sheds, moorhen, sausages, weather on January 4, 2017 by quercuscommunity. It was busy on the lane today. First we startled a charm of goldfinches, then we had to pull over for the farm telehandler and finally for a post office van as it left the farm. We already had one parcel, which was delivered to the house on Friday, and there was another waiting for us in the centre. It’s just like Christmas, though I’m not sure that I’d have asked Santa for a pamphlet of sausage recipes or a large poster of pork joints. The other parcel has our wild flower kits from Kew, including guides, markers, seeds and bee houses. It’s a good scheme and we are going to be using it as one of our main activities – from preparing the beds to reporting on the flowers and the insects they attract. I’m making a new page for projects with a sub-page for Growing Wild. As usual, because I haven’t made a new page for some months, I’ve been struggling to remember how to do it. Fortunately it came back to me. The group has had a busy morning helping with lambing, collecting eggs, recapturing one of the Light Sussex (which had escaped notice on Friday when we rounded up the other escapees) and looking at the Nottingham Peregrines via the web link. This afternoon we will be putting new bedding in the poultry so they are clean and fresh for our visitors tomorrow, and planting seeds. This entry was posted in Care Farm, Environment and tagged Light Sussex, peregrine falcons, sausages, seeds on April 4, 2016 by quercuscommunity.